and there is no-one better to go to for either a quick question on paint colours or a more in depth laying out of a new house. We have benefitted from Lucinda's advice on three personal homes and a number of other let properties, and if nothing else the whirlwind experience of receiving a constant stream of fabulous advice while walking round a property is not to be missed! The time and money that I spent with Lucinda when I moved into my flat in London was absolutely invaluable. She transformed a space that was OK into a space that was fabulous - and absolutely my style. I will never move again without seeking her advice and expertise. She very quickly understood the look that we were after and proposed schemes – colour, fabrics, composition - that really worked. But her advice didn't stop there – when we started to implement the schemes she helped us with great tips on where to get stuff – from well-priced lighting and furniture, to cushions and even light switches. She was also always available on email if we needed help or had a panic. Working with Lucinda has produced beautiful results, saved us a lot of time and banished stress from the process. I would highly recommend Lucinda to anyone who is building, renovating or decorating their home. She saved us a lot of money by directing us to websites and companies which offered exactly the sort of high quality materials and products we were looking for, but for substantially less than high street prices. She sourced a kitchen supplier who built our kitchen for less than half what other companies had quoted, and yet it has all the hand-made craftsmanship and timeless style we sought. She came shopping with me for bathroom tiles, and has an ability to hunt down a brilliant bargain and make something that looked plain in the shop look immensely elegant back at the house. So rather than being simply an additional cost, she reduced our budget in the overall scheme, and prevented us from making many expensive mistakes along the way! She cleverly found a spot for a spacious linen cupboard when we thought we didn't have room, drew up a sophisticated lighting and electrical scheme and amended the floor plans to ensure that our furniture worked in the new rooms. 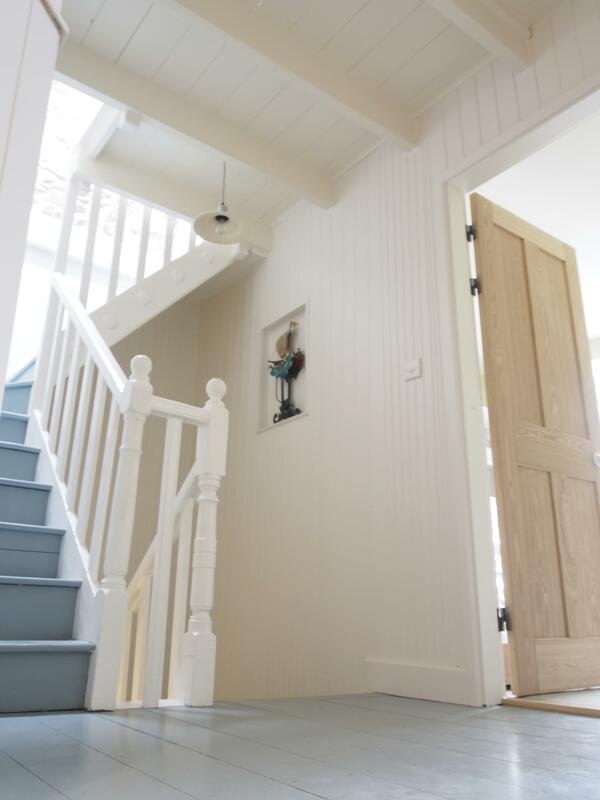 She also assisted with appropriate proportions for our staircase, architraves and skirting boards, and she could always quickly come up with multiple solutions to any challenge, big or small. 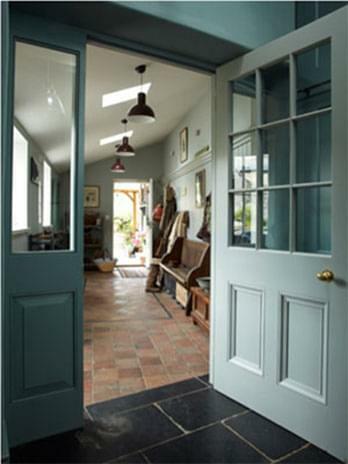 Unable to find the style of internal doors we were looking for, she directed us to a local reclamation yard who made oak doors that perfectly complemented our rustic barn style. 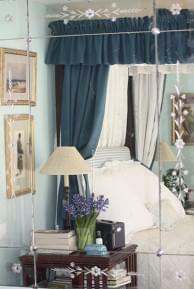 Lucinda was also invaluable when it came to decorating, creating a coordinated colour scheme that we love. She also advised on flooring, tiles and fabrics. In summary, Lucinda has an astonishing knack of creating a 5 star look, whatever your budget. She can help with a massive project or just a small aspect of your home improvement. She has an amazing talent for both large scale design, and for paying attention to the tiniest of details (eg making sure our sink was big enough to soak a large AGA roasting pan after the Sunday roast!). As we look around our finished home, we are truly delighted with the finished product, and we owe a huge amount to Lucinda's vast skills and guidance. The conversion process was much less stressful and the results are infinitely superior and less expensive than if we had tried to do it all ourselves. Do pick up the phone and call Lucinda - you won't be disappointed! She has been a lifesaver. I had no idea how many decisions would be involved with our renovation. Lucinda has guided me through the process with ease - she knows just where to go and has really helped me to steer our builder to the best solution from a decorating perspective. Make sure you get her involved at the front end of the project. On the strength of Lucinda’s advice I rented a large 6 bedroom farmhouse within a week of it being on the market at the height of the recession in 2008. The first family to view it took it. I cannot recommend Lucinda highly enough; it was like having my very own ‘house doctor’. She saved me a huge amount, both in time and money. She was there on hand from the start to the end of the project with plenty of pertinent advice, steering me away from many potential pitfalls of the first time landlord. The whole idea of using an interior designer was quite alien to me but she saved me a great deal of money. All her advice on contemporary style, colour choice, sourcing elements, and creating the overall atmosphere of the house was 'spot on'. She did not dictate how things should look but worked together with me on achieving the look we wanted and incorporating elements from the old house. I had a very limited budget, and overall we spent two or three half days working on the project. To anyone considering that to consult Lucinda for even a small number of hours would be an extravagance can be completely reassured that it will be the best investment they can make. She stops you making very costly mistakes, is worth every penny and I have a home which is individual and much admired. We were convinced that we didn't need help with our house, but employing Lucinda was the best decision we made in a 3 year project. She transformed our decision making process into something enjoyable and helped us make the most of our budget. I only wish we had got her involved from the start - it would have saved us from some expensive mistakes. Lucinda's time has been the best investment we have made. She has given us the confidence to really make the most of our house, and our taste. Even if you don't think you need any help, I would suggest you call her. We were on a tight budget and didn't think we could justify any help but we are so glad that we did call Lucinda. In just a couple of hours she honed our ideas into a workable plan that gave us exactly what we had dreamt of but had thought we couldn't achieve. She also fine tuned our electrical plan and prevented us from making a couple of mistakes on the layout and paint colours that would have been very expensive to rectify. Her time was the best money that we spent. Mr & Mrs H Trotter, London.